Steeped in heady aromatic spices, and characteristically layered, this is a home-style version of the regal Biryani dating from the Mughal Empire in India. A biryani is vastly different from a pulao, namely in the number of spices it uses, its fragrant aroma and the layering of rice and meat. If you need a reason to create a lavish feast, the festive season is the perfect time to try your hand at a biryani. Venison adds a seasonal twist to the dish. 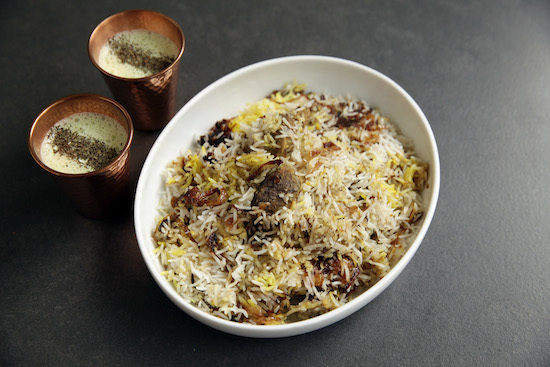 This recipe is for a Kacchi biryani, which means the rice and meat are assembled raw and then cooked together. Using turmeric is unusual, normally limited to biryani hailing from Kolkata in West Bengal. But worse crimes have been committed in the name of Indian cooking and I do think it works very well to mask the gamey smell of venison and help it do better justice to the spices. You will need a heavy-bottomed casseroled pot, big appetite and a raita for when the lid lifts eventually. In a glass or ceramic mixing bowl, stir the meat ingredients together and leave to sit. Now, wash the rice in a sieve until the water that seeps through runs clear. Leave the drained rice to sit in the sieve. Next, finely slice the onions. Bring the oil to heat in a large frying pan or sauté pan and caramelise on a medium flame with a couple of pinches of salt. This will take a good 15 minutes and you need to stir from time to time. Turn the heat off and move the pan onto a cold hob. Warm the milk in a microwave quickly, and stir in the saffron, leaving this until later. Then start the rice in the casserole pot. Bring four cups of cold water to boil with the cardamoms, cinnamon, cloves and black peppers. While it’s getting ready, preheat your oven to 190 degrees C. When it starts bubbling, stir in the washed rice and ghee and bring back to the boil. Boil for two minutes, then drain, reserving the water, and keep the rice in the sieve. Time to assemble your biryani. Wipe the casserole pot clean and smear a tsp of ghee or butter on its base evenly. Place the venison cubes with all of its marinade on top, pressing down and arranging the pieces until you evenly cover the base. Sprinkle the salt on to the rice and then spoon half of it on to the meat. Then top with half the caramelised onions, a grating of the nutmeg, and a dotting of half the saffron infused milk and the teaspoon of ghee or butter. Sprinkle a tablespoon of the reserved rice water on top. Then repeat with the remaining rice, ensuring all saffron strands have been evenly distributed. If using the rose water, sprinkle it over the top, then seal tight with foil, then the casserole lid and oven bake for 45-50 minutes. When the time is up, leave the venison biryani to settle for five minutes before you lift the lid of the pot and savour its contents. Hi Mallika, I came to your site as I hadn’t received any recipes etc for a while. I see you have been blogging but I haven’t received. I tried to rejoin your mailing list but it tells me I am already subscribed. Maybe a couple of gremlins (or elves) in the works?? Is the two tablespoons water added to the rice enough for it to cook in the end? Could you also use this recipe with other meat or chicken? Just love your version of biriyani,different from what am used to. What on earth is a black pepper? Where can I buy them? Looking really awesome. Thank you for sharing nice recipe. It looks so yumm, I am gonna try this.thanks for sharing such a yummy recipe.